Bile is an aqueous, alkaline, greenish-yellow liquid whose main function is to emulsify fats in the small intestine and to eliminate substances from the liver. The liver produces 0.25-1L of bile per day. In this article we shall consider the many different components of bile, and how these are produced in the liver. Bile is made up of bile acids, cholesterol, phospholipids, bile pigments (such as bilirubin and biliverdin), electrolytes and water. The bile acid dependent component is produced by hepatocytes. The hepatocytes secrete bile acids, bile pigments and cholesterol into canaliculi, which are small channels that transport the bile acid dependent portion towards the bile ducts. The bile acid independent component is made by the ductal cells that line the bile ducts. These cells secrete an alkaline solution – similar to the fluid made by pancreatic duct cells. The hormone secretin stimulates this secretion. Both the dependent and independent components of bile enter the intrahepatic bile ducts which drain into the biliary tree, a series of ducts which transport bile from the liver to the gallbladder and duodenum. Bile is continuously produced, but we only need it during and after meals. Therefore the gallbladder concentrates and stores bile, by removing the water and ions. After eating, the hormone cholecystokinin is released from the duodenum. This stimulates gallbladder contraction and relaxes the sphincter of Oddi, thus allowing bile to flow into the duodenum. When these bile acids are conjugated with the amino acids glycine and taurine, they form bile salts. Bile salts are more soluble than bile acids and act as detergents to emulsify lipids. Bile salts are amphipathic which means they have a hydrophobic end which is lipid soluble and a hydrophilic end which is water soluble. This structure allows bile salts to emulsify fats into smaller droplets, increasing the surface area for lipids to be broken down by duodenal lipases. The bile acids coat the products of lipid breakdown as well as cholesterol and phospholipids to form spherical structures known as micelles. Micelles play an important role in the digestion of fats and transport their contents to the intestinal epithelium where they can be absorbed. However, the bile acids don’t enter the gut epithelial cells with the lipids, rather they recirculate back to the liver, via the enterohepatic circulation. Bile also contains bile pigments which are excretory products of the liver and include biliverdin and bilirubin. Bilirubin is a breakdown product of haemoglobin and is conjugated in the liver and secreted into bile. Bile pigments are normally excreted in the faeces and make the faeces appear brown. Problems in the liver or biliary tree often result in the accumulation of bilirubin in the blood, which manifests as jaundice. 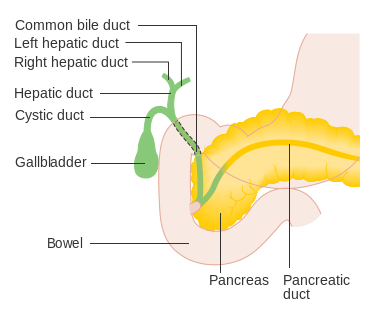 Bile passes out of the liver through the bile ducts and is concentrated and stored in the gallbladder. During and after a meal, bile is excreted from the gall bladder by contraction and passes into the duodenum through the common bile duct. Most of the bile acids are reabsorbed in the terminal ileum and returned to the liver via the hepatic portal vein. The liver then extracts the bile salts. The enterohepatic circulation allows the liver to recycle and preserve a pool of bile acids. Gallstones are small lumps of solid material that form in the gall bladder. Abnormal concentrations of bile acids can increase the risk of precipitation of bile out of solution to form stones. They can be made up entirely of cholesterol, bile pigments or a mixture of the two. Risk factors for gallstone formation include being female, obesity, age >40, and poor diet. 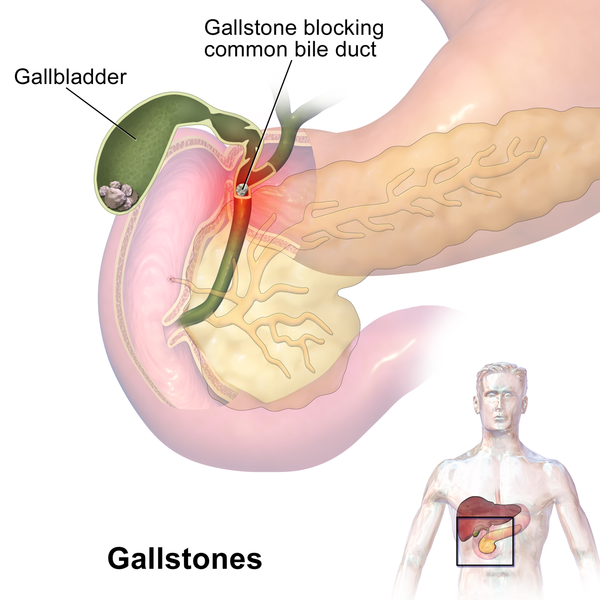 Gallstones are often asymptomatic but can cause painful biliary colic if they move to occlude the neck of the gall bladder or the biliary tree. Biliary colic is intermittent pain in the right upper quadrant, typically precipitated by the consumption of a fatty meal and subsequent contractions of the gallbladder. This can lead to further complications such as cholecystitis (inflammation of the gallbladder) or ascending cholangitis (inflammation of the bile ducts). Associated symptoms include nausea/vomiting, abdominal pain, jaundice and fever. Pre-hepatic jaundice: This is where excessive haemolysis takes place and the liver is unable to conjugate all the excess bilirubin, leading to high levels of unconjugated bilirubin. Causes of this include inherited red cell defects (e.g. sickle cell), congenital hyperbilirubinaemias (gilberts syndrome), or acquired autoimmune diseases/infections. Hepatic jaundice: This is where reduced hepatocyte function means that bile is not conjugated efficiently. A mix of conjugated and unconjugated bilirubin will be present in the blood. Causes include hepatic inflammation (e.g. hepatitis), liver cirrhosis and hepatic tumours. Post-hepatic/obstructive jaundice: This is where the drainage of bile is obstructed, causing conjugated bilirubin to back up into the liver and overflow back into the blood. Causes include gallstones, hepatitis, strictures, tumours and pancreatitis. Steatorrhoea is another symptom that can indicate dysfunctional bile production. If bile acids/salts or pancreatic lipases are not secreted in adequate amounts, less fat emulsification and absorption occurs which causes fat to appear in the faeces. The faeces appear pale, floating and foul smelling, which is known as steatorrhoea. Which of the following is not a constituent of bile? Which hormone causes gallbladder contraction? Which of the following is not a cause of pre-hepatic jaundice?